The Fortress of the Pearl supplements Michael Moorcock's classic Elric Saga, which tells the tales of Elric of Melnibon�. This volume takes place during the previously undescribed gap between "Elric of Melnibon�" and "The Sailor on the Seas of Fate." Exercising questionable judgment, Elric has left his betrothed, Cymoril, and left the Ruby Throne of Melnibon� in the ambitious hands of his cousin Yyrkoon while he explores the human lands of the Young Kingdoms and beyond. Elric wanders into the depths of the Sighing Desert searching for the fabled city Tanelorn, but instead finds the desert city Quarzhasaat -- renown for its riches, self-absorption, haughtiness, and self-imposed ignorance of the outside world. In short, Quarzhasaat is much like Melnibon�. Elric becomes embroiled in the convoluted, cruel, and self-important politics of Quarthassat, including a quest to obtain the legendary Pearl at the Heart of the World. 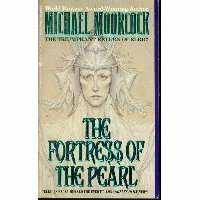 As a longer work, The Fortress of the Pearl gives Moorcock plenty of space for discussion on such topics as dreamthieving (a new concept for the Elric books) and the nature of reality. For my taste, this discussion was excessive because it did not add much to the understanding or enjoyment of the work. Too often, even the characters engaged in such discussion confessed to less than full understanding of it. However, much of this is limited to Part II, which was particularly "atypical Elric." In contrast, Parts I and III are far more similar to the old serials that form the core of The Elric Saga in tone, excitement, writing, and structure and so contain all his trademark elements of detailed societies, a unique assortment of characters, and fast action. Although The Fortress of the Pearl is chronologically "Book 1 and 1/2" of The Elric Saga, it contains numerous references and foreshadowings that are likely be more appreciated by a reader who has completed the core series than one who has simply read "Elric of Melnibon�." The import of characters such as Jaspar Colinadous (an incarnation of the Companion to Champions, a multiverse standard) and his magical cat, Whiskers, might well be lost on the uninitiated. Further, "The Fortress of the Pearl" does not contain the intense character and plot development that the core books do, nor does it much explore many of the issues that come to obsess Elric, such as his place in the world or his relationship with his vampiric runesword Stormbringer and the gods of Chaos. Yet, it is not filled with the philosophical musings that consume the most recent Elric novels like "The Skrayling Tree." As such, The Fortress of the Pearl is a transitional work somewhere between the old serial style and the new metaphysical one, successfully completing the balancing act and delivering a good tale. Dave, I was simply going by the fact that we have 5 Elric Collections and 1 " Best of Micheal Moorecock " vomule available... Though you are correct, I've yet to actually see all 6 of those in any one place at the same time, and I'm sure by the time Volume 6 of elric comes out the earlier ones will not be as easy to find as they are now.. consider its got 2 years or something before its out.. Still I understand hes pretty popular in the UK.. for whatever reason him and Pullman have managed to ingratiate themselves to the literati and whenever a hit piece against " Everyone else " in the genre field they turn to those two. Like that one about REH a few weeks ago.. where he came off as so patronizing not just to REH, but also fans of REH.